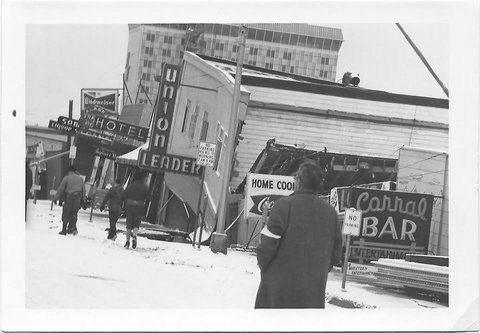 Alaska 1964 Earthquake Pictures - rare photos tell the incredible story of the destruction in Anchorage caused by the 9.2 quake that lasted 5 minutes. Do you appreciate these pictures? while you scroll down this page and look at the pictures. The audio above was recorded by Robert Pate of KHAR radio in Anchorage. This was recorded on Blueberry Road near the northeast corner of Northern Lights Blvd. Buildings moved off their foundations left and right. Buildings torn apart, compressed and strong I-beams were twisted into what more closely resembled red licorice candy vines. The power of this quake was unimaginable. And even those of us Alaskans who experienced it, will never be able to forget the memories that haunt us to this day. 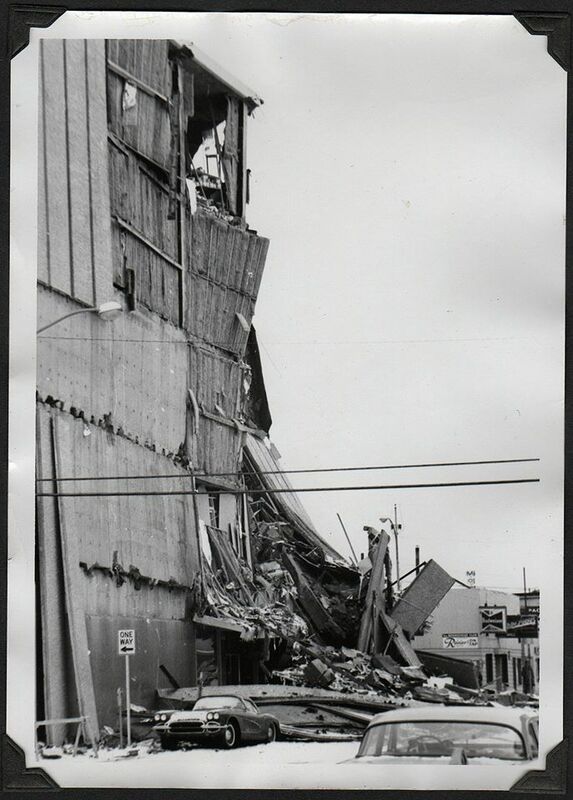 The picture above shows huge concrete slabs that fell off the outside walls of the JC Penney building in down town anchorage, crushing cars below. And, embedded in those concrete slabs were decorative pebbles that shook loose and showered the street, people and cars below like hail falling from the sky. 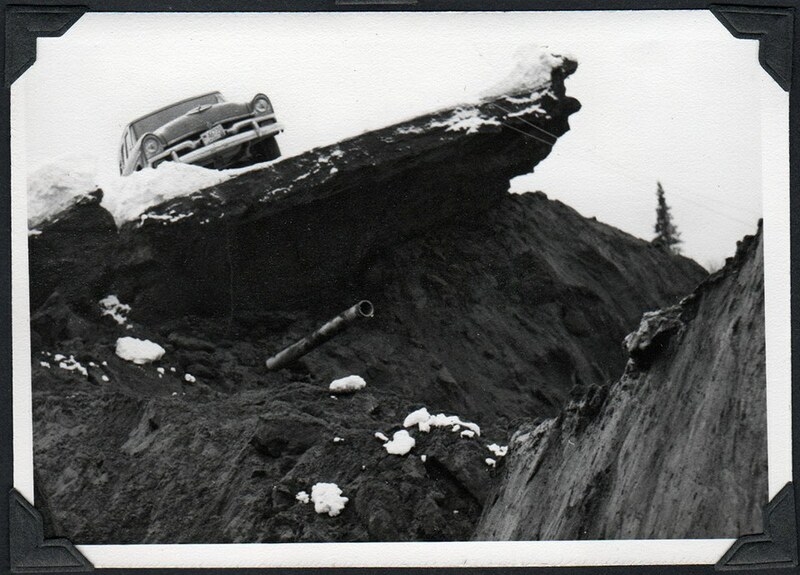 These Alaska 1964 earthquake pictures by Helen Bucy have an almost haunting quality about them. It seems that no matter how many pictures and videos of the earthquake we see over the years, we can still be amazed by the sheer force of nature as captured by those who experienced that Good Friday earthquake. 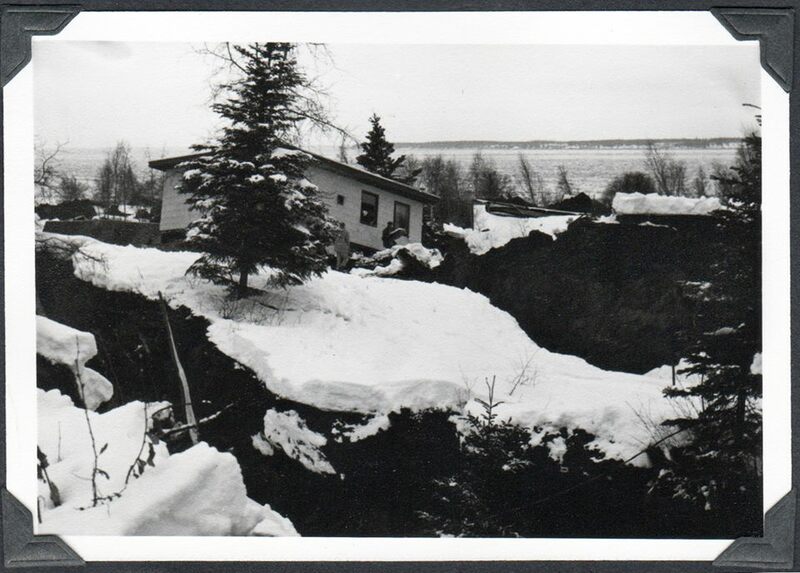 Homes were pulled from their foundations and many in the Anchorage area known as Turnagain, slid toward the waters of Cook Inlet before coming to rest. As you can see from these pictures, the powerful quake left many of these homes sitting on broken chunks of land with trees sticking out sideways and some homes above the dirt, some under and some torn apart. 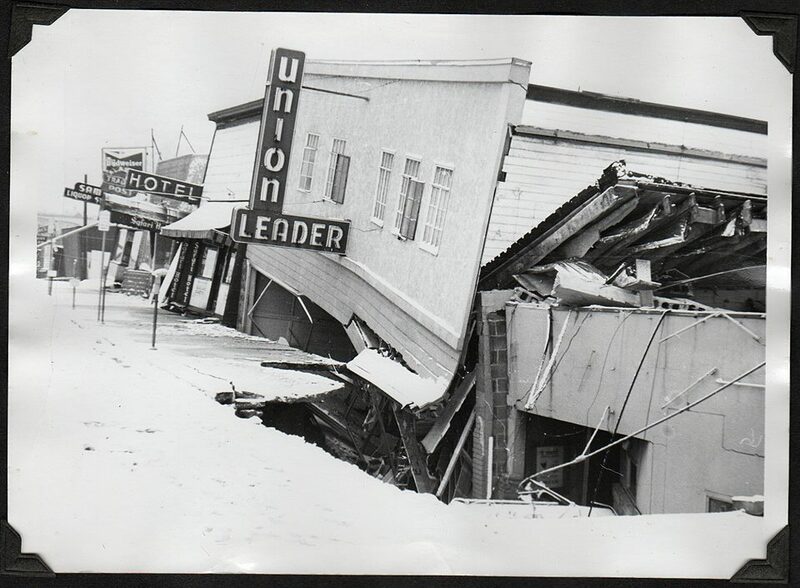 Alaska 1964 earthquake pictures like the one above, remind us of just how destructive the Good Friday quake was to the people of Anchorage who saw their homes torn apart. In many cases, while they were home. Imagine the horror of being inside the building pictured above as it came crashing down on the sidewalk below. The book below was written by a then teenage girl who was in the JC Penney building when the quake struck and is her story of survival. A short, must read. 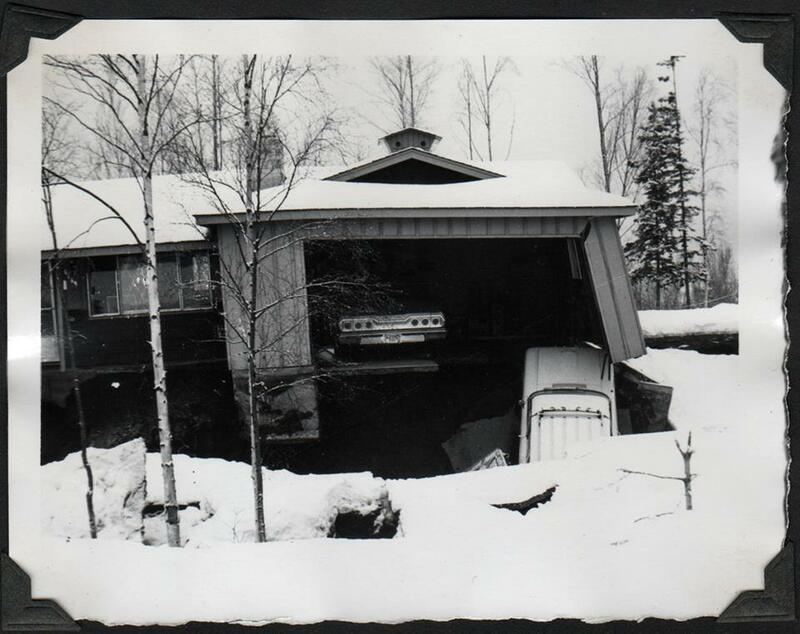 Only the top of the log home above remained after the earth finally stopped shaking. Seeing these homes gives us a closer look at what the residents of Turnagain went through. The home above was torn in half. and you'll get just an idea of what it must have been like for those of us who survived. Once two homes, during the 1964 earthquake they were smashed together. A home torn from it's drive way. Or was it a drive way torn from the home? Incredible destruction. 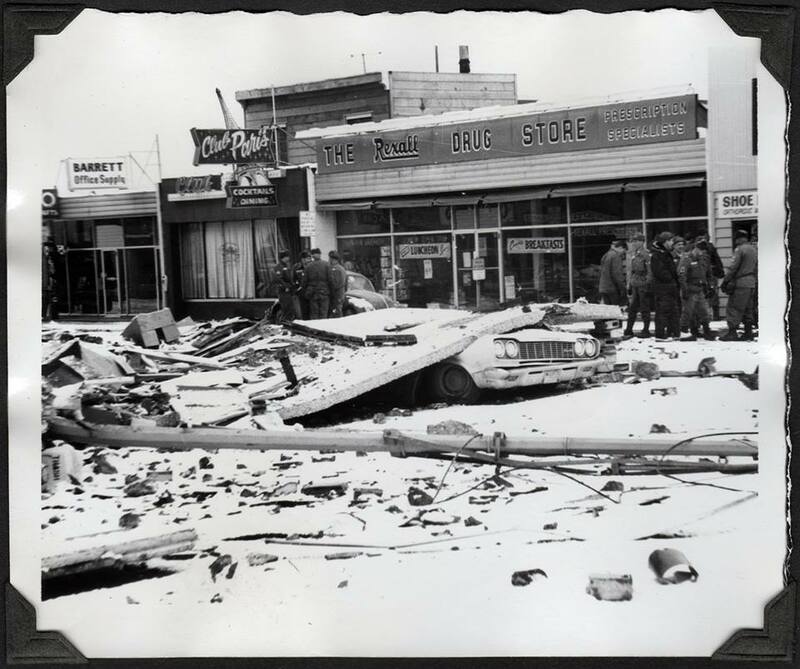 Alaskans who lived through this tragic earthquake, still remember many of the businesses that were destroyed by the powerful force of this 5 minute shaker. 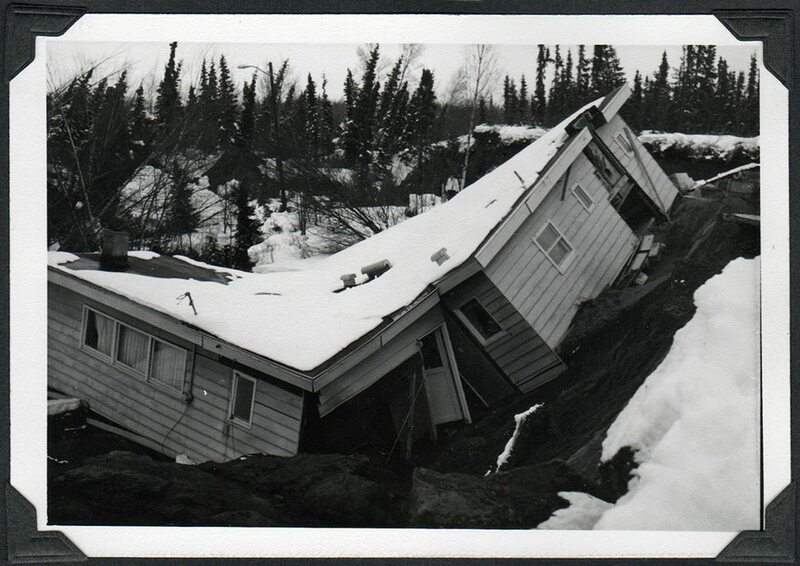 And these Alaska 1964 earthquake pictures are an amazing reminder. Unless you lived through this quake, it's hard to imagine the horrific impact of seeing your town destroyed like this. There were so many shops, restaurants fun places to go window shopping that were simply gone when the earth finally stopped shaking. 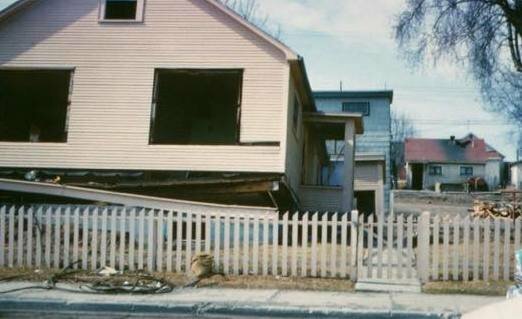 As you look at these pictures, it's hard to imagine that before the 1964 earthquake, this was an Anchorage neighborhood. After the earth stopped shaking, these homes looked more like they were just "dumped" near a sidewalk and left. 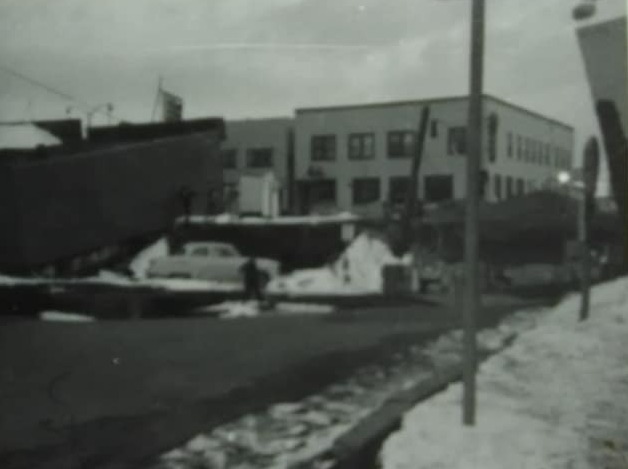 Amazing scenes of buildings that were once home to residents of Anchorage. 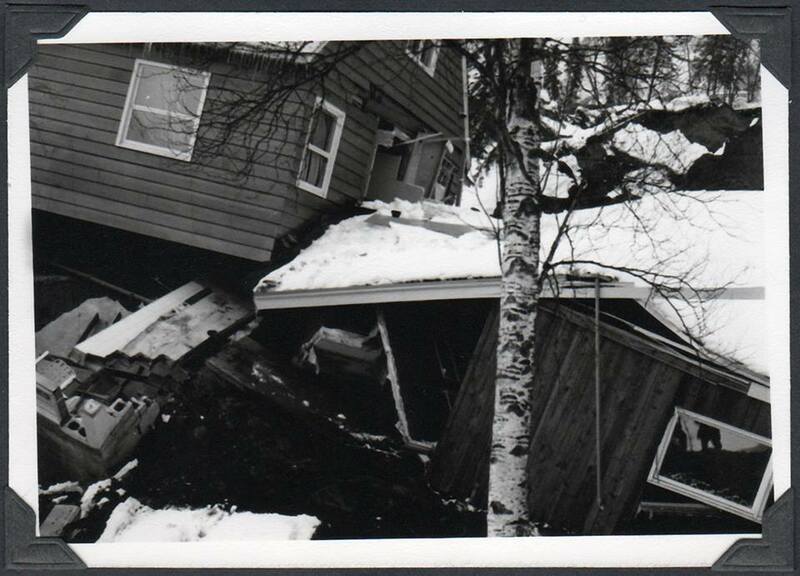 And these Alaska 1964 earthquake pictures are a reminder of the incredible force generated by the 9.2 earthquake. 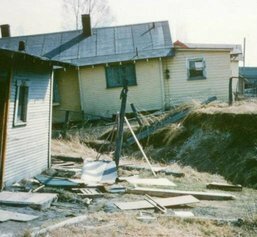 These color pictures by Diane S. Smith of the destruction in and around Anchorage, caused by the Good Friday earthquake, are a look we don't often see. Homes pushed from their foundations, businesses completely destroyed, lives forever changed. 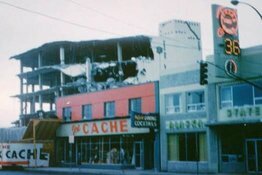 Many of our favorite stores and shops were so badly damaged, that parts of Anchorage looked like a strange ghost town. The banner over 4th Avenue in Anchorage was there to promote a play called "Our Town". After the quake, the banner became a strange reminder that it was our town. 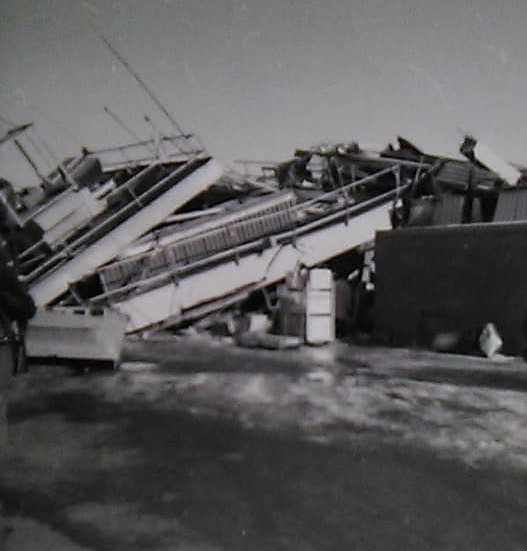 Over the years, we've seen a number of photographs taken of the damage and destruction on 4th Avenue in Anchorage following the 1964 earthquake, but these pictures by Starr Judkins Lane give us a different look. After our 5 minute earthquake had ended, those strong, hard after shocks continued - and "Our Town" would never be the same. 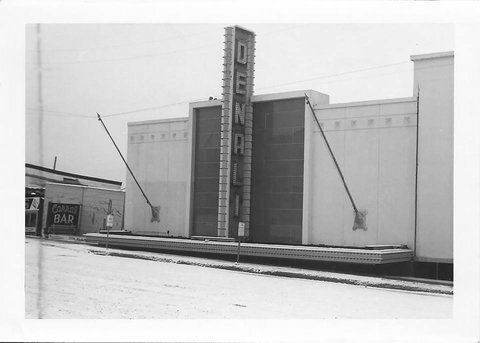 Like many buildings in certain parts of Anchorage's 4th Avenue, the Denali Theater pictured above, ended up lower than the sidewalk in front of it. 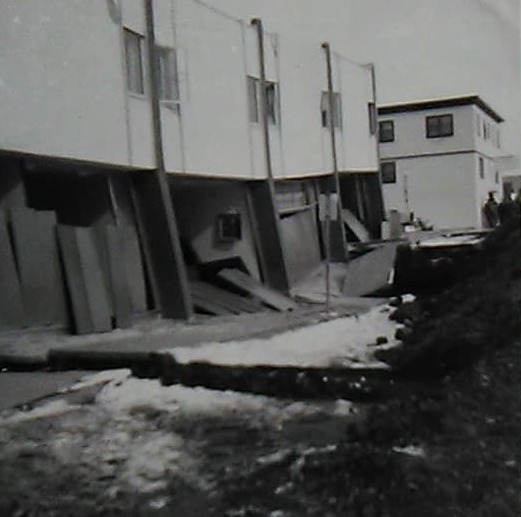 Liquefaction, the process where normally solid ground, turns into a kind of liquid when it's put under stress, caused buildings in down town Anchorage to slide off their foundations. 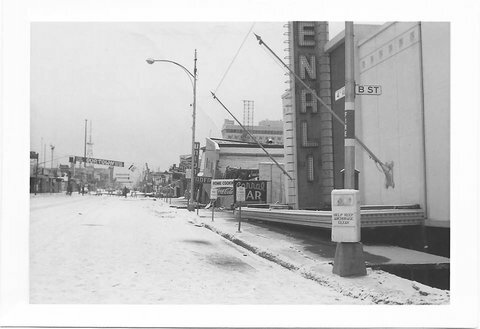 Long before it's Spenard location, Anchorage's Denali Theater was located in downtown Anchorage on 4th Avenue. A sad sight for those of us who had so many fun memories of seeing so many movies in that famed theater downtown. 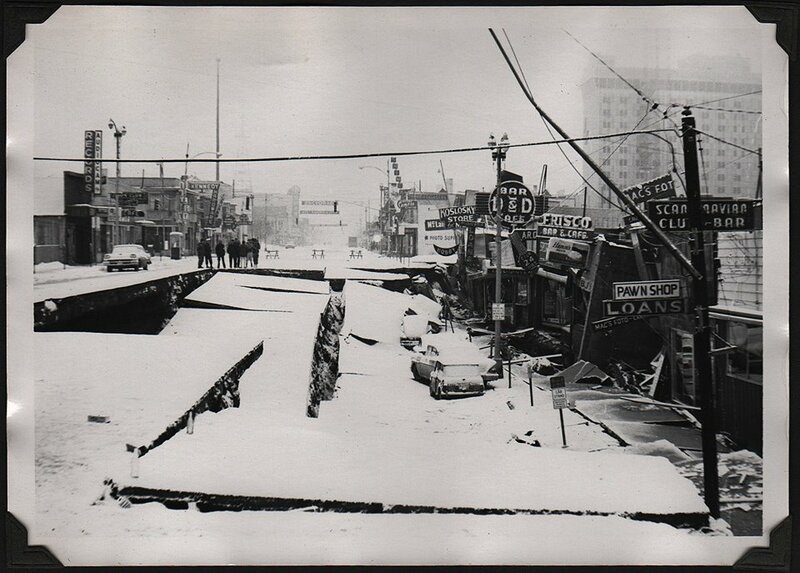 Do you have pictures you took of Anchorage following the Alaska 1964 earthquake? If you do, we would love to include them on this page. And we are happy to include your name as the photographer. 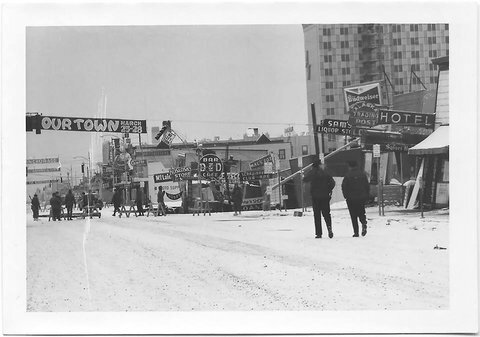 To have your pictures included on Anchorage Memories, contact us right here and we'll tell you how (it's so easy). 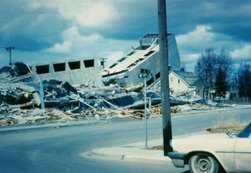 Both Mary and I (Mike) of Anchorage Memories are survivors of the 64' earthquake. 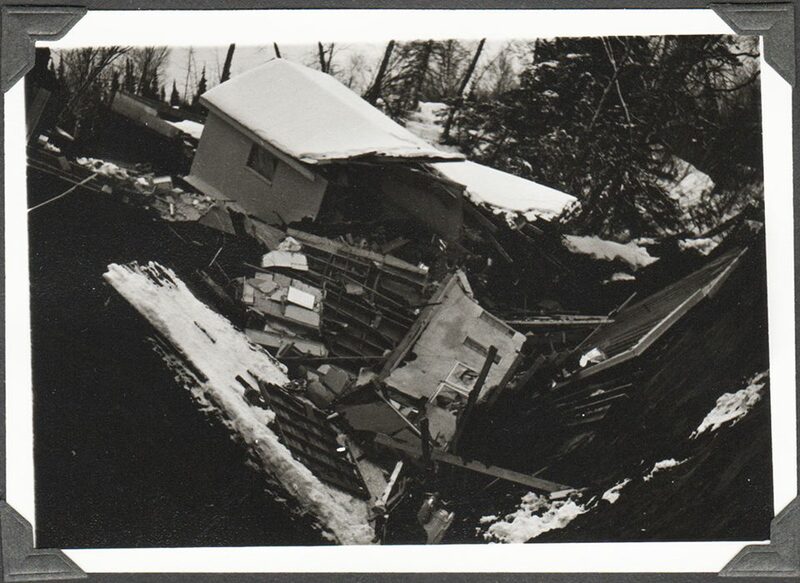 And these Alaska 1964 earthquake pictures so vividly portray the events of that Good Friday. And while my experience was terrifying and one that I will never forget, Mary is blessed to have survived her horrifying ordeal. For both of us, like many of you, it's sometimes hard to look at the pictures you've just seen above, but a necessary reminder for not only those of us who survived that never-to-be-forgotten Good Friday, but for those who did not experience this profound and powerful quake. So, with tear filled eyes, I say this - we hope and pray that no one ever has to experience a 9.2 earthquake and live with it for the rest of their lives like Mary and I and so many of you have. 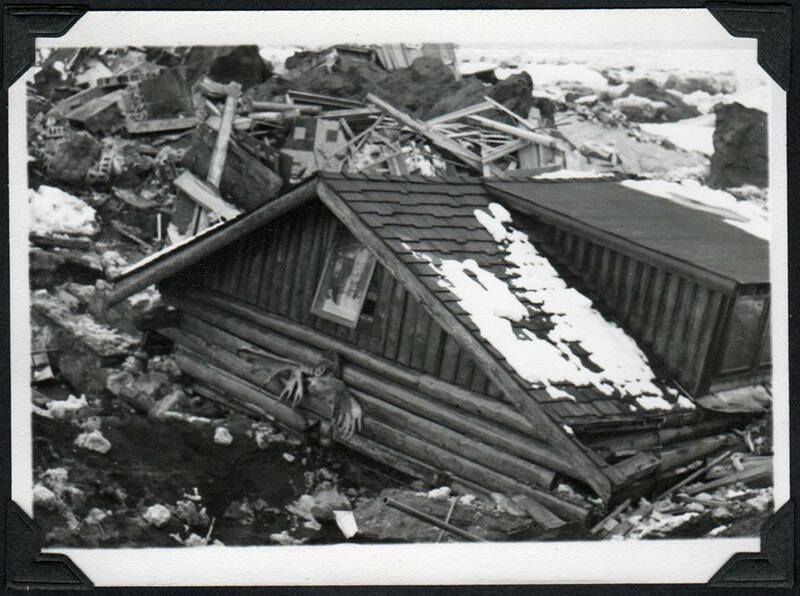 Now check out, Alaska 1964 Earthquake Stories, right now.